Danny advised so when we walked past a beautiful bamboo forest last year in October when he came to visit my field site. At that time, after five-months of fieldwork I was frustrated about the situation that on the one hand, I felt as if I was mining hard on poor ground- there was nothing (no longer) new under the sun! On the other hand, I somehow felt it’s very awkward to ask ‘formal’ questions to the informants who treat me as a friend and I didn’t want to lose the relaxed atmosphere which I believe allows people to show the ‘true self’. “Well, I see, but I still need some time to figure out HOW” I curled my lip and said. It is really not easy to ask questions, even though the pre-fieldwork project meeting prepared well HOW to do this. Now, at the last phase of my fieldwork, when I look back and ask myself whether I feel any regrets about ‘asking questions’ during my fieldwork, I think the answer is NO, but with several footnotes. First, useful questions do not necessarilyhave to be asked in a interview-like formal way or even with a question mark. My strategy is to follow people’s organic conversation flow and ‘harness’ the topic by relevant detailed inquiries or directional claim. That means most of the time my inquiries are impromptu. However, such improvisation is not as random as some laid back chic-chat among friends, it has to point towards the impact of social media. In practice, asking questions in a contextual way to address a research question is a mind-taxing and thought-racing process. Do you have your partner’s social media password, if so, could you tell me why and how do you get it? Will you remove your ex partner’s photos on social media profile? if so why? and why do you think some people keep their ex partner’s photos on social media? How do you deal with your partner’s ex-partner’s photos on social media? Furthermore, all my roundabout inquiries are actually aiming to put pieces together of a bigger puzzle, which is the relationship between intimacy and social media usage. Nevertheless, I am not suggesting that such theatrical questioning can be applied in every case- it works only when a researcher has a relatively comprehensive knowledge of his/her informant as well as the circumstance during the conversation. The funny thing is after just one month when I came back to the same informant and tried to go through some more interview-like questions she appeared slightly uncomfortable and confused about my question with regards to the intimacy and the usage of social media, and asked me why I was interested in those ‘useless’ things and what for. Clearly she forget that’s the reason I was in my field site and I was a researcher which I had told her one-year ago. Her attitude is understandable as for people who have limited education (like many of her fellow workers in the factory she is a middle-school drop-out) and living experience with academic research, words like ‘research’, ‘questionnaire’, ‘interview’, etc are more often than not very alien and sometimes even horrific. Thus it is safe to say the way to ask questions is as important as, if not more, the questions per se. Secondly, at the closing phase of my field site I started to ‘push the boundary’ and pin down some questions I did not want to ask for the reasons I just mentioned above. The efforts were not in vain. Even though my informants appeared unsurprisingly uncomfortable and couldn’t give me a articulate answer in many cases. They still gave me some valuable information I couldn’t have gotten just by chatting with them, such as do they visit pornographic websites or describe their social media usage situation in the past five years. Meanwhile, I spent almost one month in Shanghai to do comparative study among urban and rural (or rural migrant) population. Jingwen Fan, a Shanghai-based artist and media researcher, worked with me to conduct interviews among Shanghainese people. Given that we didn’t have enough time to carry out proper anthropological participant-observation, which I was doing among rural migrants in my field site, our interviews targeted personal friends and relatives of Jingwen Fan and I, with whom we have established strong mutual trust and understanding. The interviews have been ongoing for more than a month and most of the interviews were filmed with consent. We have a list of 24 questions for the interviews (I will post the list of the questions in my next blog posting), which according to my one-year ‘questioning’ experience will lead to some active interaction and valuable data. So far, the interviews went very well even though I was slightly worried about what Margaret Mead said, ‘What people say, what people do, and what they say they do are entirely different things’. We appreciate that most of all of our informants trust us a great deal and actively interact with us by showing us their social media profiles and sharing with us their personal stories without hesitation. And on top of it, the people we interviewed not only expressed themselves very well but also discussed different issues with us passionately. Some of them started an answer by saying “You know what, actually I thought about exactly the same question recently and I also discussed it with my friends…” More often than not, a filmed interview took around three hours. 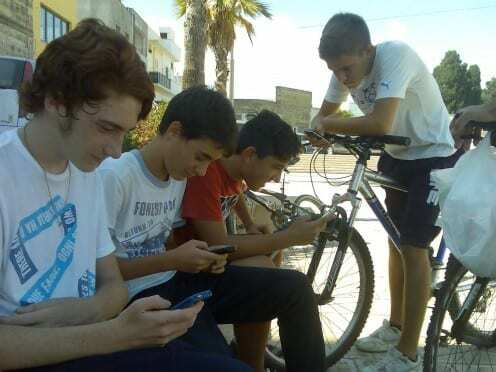 This blog post is about some of the significances of the huge difference in the usage of social media between teenagers and other people in the Italian fieldsite. If we are looking at the average usage of social media, we could easily identify a few groups that are corresponding to different age groups. The first group is constituted by teenagers aged up to 16-18 year old who use social media, and especially Facebook, quite intensively. This means that most of them have around 1,000 online connections and if they are not always-connected through a smartphone than they may spend a few hours a day or every few days on different social media. This definitely contrasts with the rest of age groups. Young people between say 20 and 30 year old use social media in a more nuanced way. Even their subscription to the service is more unpredictable. If most of the young people who use some sort of social media have on average around 200-300 online connections, there are individuals, like the ones described in my previous post, who near 1,000 connections and have very precise strategies for online communication. At the other end of the spectrum around 20% of young users who have a few tens of connections and engage sporadically in any social networking activity. The way these people think about online media is actually very close to the way young people who refuse to subscribe to any social media at all motivate their resistance. At the same time, the way young people use Facebook or Twitter is much more heterogeneous than in the case of teenagers: it ranges from a few minutes a week to a few hours a day and from random to constancy. It is interesting that most of the time this usage is quite consistent for any given individual and does not necessarily depend on the time of the year or on the work schedule. Then, for adult population figures drop dramatically, from around 30-40% of young adults who are active on at least one social media to around 20% in the case of adults. Old people use social media rarely, and usually in relation to some younger relatives who live elsewhere and actively encourage this usage. Most of the time this media is skype, that seems to respond better to the exigencies of this particular kind of distant relationship. The reasons are many, from its synchronous character, the possibility of high quality video conversations, to the ease of its usage which is a highly important issue for old people who usually have relatively poor computer expertise. Therefore, we have this highly unequal distribution of knowledge and practice in relation to social media across the town population. As most of the literature in this area focused on teenagers and different affluent, and influent, people or social groups, our project objectives aim to cover other segments of population as well as some particularly overlooked social issues. However, before doing that we need to understand the important differences in terms of penetration and usage that seem to exist in most of the sites in this project. The questions that have arisen from the preliminary survey on the usage of social media that we undertook in the Italian fieldsite are many. I will discuss here just one aspect: the very different numbers and intensity of usage in relation to social media among the various age groups together with the complex social relations between people belonging to these age groups seem to indicate the fact that it would be completely meaningless to focus exclusively on social media. That is, social media could not account but for a particular part of the society and the relationships that are at work here. At the same time, social media seems to be a very helpful lens through which we, as anthropologists, could make sense of these relationships exactly because they are objectified in a very transparent and accessible medium. In particular, I suggest that the numbers presented in this post point not to an inequality between different age groups, but rather to a very specific mutual completion of these. Some of the ways society understands to use the numbers related to social media are more obvious: for instance, the educational systems’ inefficient attempts to adapt themselves to the impressive request and consumption of new technology and media. These attempts seldom imply massive public spending on initiatives that are at least questionable, such as the new-technology-for-the-disadvantaged or the ones promising the migration of sensitive schooling processes on different IT infrastructures. These are examples of ‘big numbers’ taken ad litteram, with little, if any, attempts of critical interpretation. As fieldwork shows, whenever ‘big numbers’ are judged independently from ‘small numbers,’ important misunderstandings happen. The simple reason is that either one of these two groups could easily be irrelevant when not considered in relation with the other or when this relation is taken for granted.